The sixth annual Gold Coast International Film Festival begins next week as more than 25 feature-length films and 40 short films will be screened at the Gold Coast Arts Center in North Hempstead, and there is one film in particular that will be of interest to tennis fans here on Long Island. “Gold Balls” is a feature film highlighting the journeys of senior tennis players, making their way across the country in hopes of becoming a National Champion and earn a Gold Ball. It explores many universal questions about aging and what makes a champion. The film’s director is Kate Dandel, a first-time director who got the inspiration for the film from her father-in-law, a retired litigator in his 80s who travels the country playing tennis tournaments. Dandel began the process of trying to raise money to continue filming and add more characters to the documentary. She met with people in the tennis world, and some of the connections she had in the film world, but had no luck with that route, so she started a KickStarter campaign, where she was able to raise $26,000, enough to do a short film. While it wasn’t enough yet to turn her story into a feature-length documentary, the money raised gave her a platform, and confirmed what she already knew: that the story had appeal and there was a market for it. She continued to plug away, and was able to win the 2016 SIFF/Aegis Living $50,000 documentary film grant, which really set her production in motion. With her new budget she was able to continue traveling the country, and introduce new players and characters into the film. The film’s themes and uplifting message made it a perfect fit for the Gold Coast International Film Festival. The film will make its local debut this Saturday at 5:00 p.m. at the Manhasset Bow Tie Cinemas, and will be followed by a Q&A with Dalden and two Long Island players featured in the film. The premiere will also be sponsored by USTA Long Island, as it reinforced many of the organizations missions, most notably the fact that tennis is a sport that can be played for a lifetime. 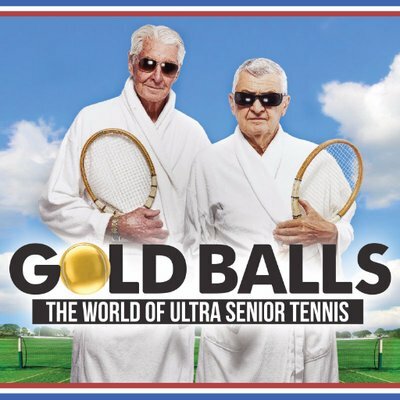 “The USTA Long Island Region is proud to sponsor the Gold Coast International Film Festival’s presentation of ‘Gold Balls’, which showcases one of our keys messages: that tennis is a sport for a lifetime,” said Mike Pavlides, USTA Long Island Region President. “Tennis can be played and enjoyed by everyone from the smallest children to the very elderly, as shown in Gold Balls. In fact, we are happy that two of our senior USTA League players are able to participate in a panel discussion following the movie presentation. Pat Molloy and Leslie Wecksler will be talking about how they have enjoyed tennis for many years and continue to play competitively. Both women participate on USTA League teams that will be competing at their National tournament this year in the 65 and over age group. Click Here for more information about the film, and Click Here for more information on the Gold Coast International Film Festival.